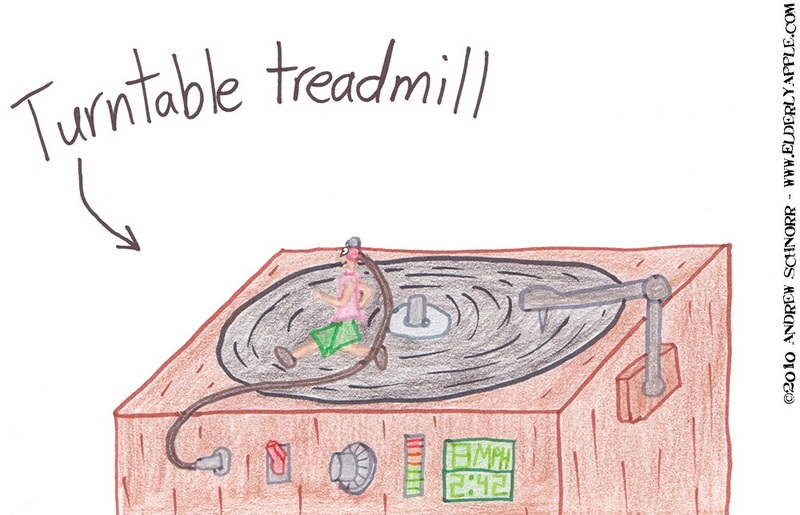 Also, considering how such a thing would work, the turntable treadmill would either be a wonderful idea, or a terrible one. After all, the speed of the music you head would be completely dependent on your speed. But then, you could argue that such slow-paced music would slow you down more and more, until you were eventually sitting in silence. By the way, is this record a 33, 45 or an old 78? I see your point Andrew, but it would really be appropriate if the vinyl he was running on was A Flock of Seagull's "I Ran (So Far Away)"
i can only imagine that disk would start to skip! GET IT?! like, running and skipping? aw, screw it!